These counselors are the core of our largest summer program: Classic Camp. They spend the summer living in cabins with 8-10 campers where they are responsible for the physical, emotional, and spiritual well-being of the kids in their care. That means leading Bible study, teaching sports, eating s’mores, making friendship bracelets, playing pool basketball, leading devotions, singing silly songs, wearing goofy costumes, and doing about a thousand other silly, wonderful, and challenging things to give kids a great experience. These counselors spend the day with their cabin of kids, either leading the activities or participating alongside them. Campers in this program can be as young as 6 years old, all the way up to 17. We put counselors with the age group that suits them best and then equip them and train them to share Christ with kids through everything we do. 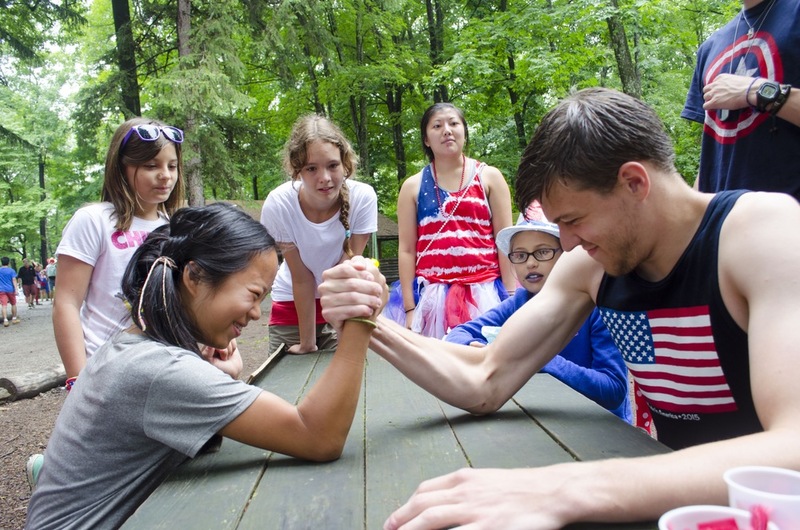 Classic Camp Counselors work at camp for nine weeks: the first two weeks are spent training before kids arrive, followed by six sessions of camp (five are one-week sessions, one is a two-week session). The starting pay for a Classic Camp Counselor is $1800, with room and board included. Next Level Counselors spend their time working with our adventure-focused camp for middle and high school students that we run for half of the summer. These campers and counselors live in the Lamont Lodge and spend each day participating in our vast adventure program. That means everything from mountain boarding to rock climbing to white water rafting, with Bible Study, pool bashes and a day at our lake thrown in for good measure. Next Level Counselors live in a room with five campers, and combine with two other rooms to make up an activity group. These groups are called “huddles” and include 15 campers and 3 staff. Campers in this program are 12-17 years old. Next Level Counselors work at camp for five weeks: the first two weeks are spent training before kids arrive, followed by three one-week sessions of camp. The starting pay for a Next Level Counselor is $700. Co-Counselors are support staff members in the Classic Camp program who are primarily responsible for a specific area of our summer camp program. These individuals live in cabins with campers and serve alongside a head counselor in the cabin, while maintaining another area of camp. Examples of Co-Counselor positions include the Pool Director, Craft Hall Director, Social Media Manager, Club & Worship Director, Target Sports Director, Nature Director, and a number of other positions. Our Co-Counselor positions are developed based on the camp’s need for the summer, as well as the skills of the applicant. Interested applicants should be experienced in their area of programming, organized and self-directed in work, excited to serve alongside another counselor, and willing to participate in all aspects of camp. While their primary job is to maintain and direct their part of the program, they are additionally expected to be able to lead Bible Study, play games, don silly costumes, and otherwise serve as a Counselor to their campers. Co-Counselors work at camp for nine weeks: the first two weeks are spent training before kids arrive, followed by six sessions of camp (five are one-week sessions, one is a two-week session). The starting pay for a C0-Counselor is $1800, with room and board included.